Welcome to a new feature on this site. Yes, there have been many "Cartoon Caption Contests" in the past (unfortunately, there have also been many "Kartoon Kaption Kontests", but I won't go into that). Of course, the most famous current contest appears on the back page of each issue of The New Yorker. So, with all due respect to The New Yorker, I'm introducing my own version of this very popular pasttime. I'll supply a drawing of one of my cartoons that has never been published, leaving off my caption. You are invited to supply your funniest captions. Simply (1) click on "Add New Comment". Then (2) scroll down past any other submitted captions and type in your name and your caption in the spaces provided. Then (3) click "Save". Your caption or captions will be posted after I review your submission. There is no limit on the number of captions you can submit for each drawing. Entries will be accepted and posted for a week for each contest, after which a winner will be announced and the winning caption will be printed. Below that I will also print my original caption. I will be the sole judge. New contests will appear at very irregular intervals in the future -- about every two weeks or so. There are no prizes . . . just the glory of knowing that you're the funniest person around. Also, there are no age, nationality or other restrictions (even employees of The New Yorker are eligible to participate). I'm still puzzling over why residents of the Canadian province of Quebec are barred from competing in The New Yorker contest. Please note that Quebecoise are welcome here, but captions must be in English. And finally, you have my word that I will never use your captions for my personal profit. "I told you the grill wasn't hot enough." "Make mine a Veggie Burger instead, please"
"Maybe HE's trying to tell you to cook your beef well done." "You can look at it as 'lucky', but I say HE's trying to tell you something about your cooking." 1. I told you not to put very hot Jalapeno in your sauce!! 2. Did you put very hot Jalapeno in your sauce? "I told you, you're not supposed to barbecue the shank bone!" First of all, feel free to use my caption for profit. Not that you would get any. Caption: "Izzy, did you forget to buy the kosher hot dogs again?" I said, "Come fly with me, not come fry with me." You dummy!!! Don't you realize the smoke signals are telling the Indianas that the cavalry are coming? 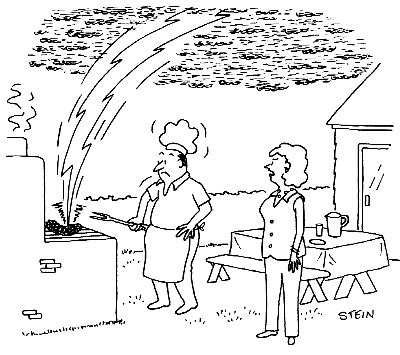 Harry, I think the grill needs a lightning rod! or Harry, I think what you said this morning made the guy up above angry. You had to go and say it again, didn't you? "This meat is so tough even God couldn't cook it." "I warned you about inviting Zeus to our cookout." And when were you going to introduce me to your new friend? I told you not to use Jack Daniels as a marinating sauce! That's not going to help the Chargers win the playoffs! You cooking dinner would have been enough of a miracle! Dammit Dan, I said Medium Rare! I didn't think that PETA was that powerful. Let's put another steak on, and see if lightning strikes twice. It's a sign from God. You were never meant to cook. If you have to sing while you cook, can you please try Food, Glorious Food next time, rather than Go Greased Lightning?
" I wish you were this exciting in all other aspects of our marriage"
I think God don't want us to have delicious barbecue today.